This year's Tevis Cup made history. For the first time since the "100 Mile One Day Trail Ride" that starts from Robie Park near Lake Tahoe and ends at Auburn's Gold Country Fairgrounds began in 1955, a paint horse became one of the top-10 finishers. Pamela Bailie of Pilot Hill and her horse, Skipa Slipa on Ice, finished sixth in the race, arriving in Auburn at 12:05 a.m. Sunday. "I'm pretty excited," Bailie said Sunday at the awards ceremony for Tevis finishers. "I think it is definitely more rewarding to have the first paint." Bailie said she took the race one checkpoint at a time, not riding too slow or too fast. "We just worked our way up," she said. "We had a plan and a time that we wanted to arrive at each checkpoint and we pretty much stuck to it." John Crandell, 2006's Tevis winner, garnered the 2007 Haggin Cup - which is awarded to one of the top 10 horses that is deemed most healthy - for the second year in row. Crandell won the cup last year on his horse, Heraldic, and this year on HH Saba Shams. Crandell arrived in Auburn at 9:45 p.m. Saturday, two minutes behind leader Jeremy Reynolds of Los Gatos. There was a four-hour time span from the time the first rider finished until the 10th crossed the line at 1:26 a.m.
Reynolds claimed the Tevis Cup but was disqualified from presenting his horse in the Haggin Cup judging after some of his crew members committed traffic violations at the Robinson Flat checkpoint, said Erin Klentos, Tevis ride director. Reynolds, who arrived in Auburn at 9:43 p.m., was allowed to keep his Tevis win, Klentos said. "We have rules and we make them very clear to both the rider and the crew," Klentos said. "We want people to understand that even if the crew breaks the rules, it can affect the rider." Klentos said she did not want to release the specific details about the infractions, but she did say the crew did not obey traffic controls in Robinson Flat, posing a safety threat to other volunteers and other riders. "We still acknowledge the rider," Klentos said. "He did a great job and his horse was excellent. And that is why we chose to allow him to win." Reynolds didn't offer any specific details either, but he did thank the cup committee. "I know there are a lot of rumors floating around about what happened," Reynolds said. "I just want to say that the cup committee was very gracious to me. We made a mistake and our crew held us out, but I just want to say thanks to everyone." The top 10 horses were screened at the fairgrounds Sunday morning and buckles for finishers and the two cups were presented in the afternoon. Ninety-five riders out of the 185 who started the ride completed it in 24 hours. That number is not unusual as the completion rate from the past 52 years averages 50 percent, and it doesn't matter if you're a Tevis expert or first-time rider, said Mike Pickett, past president and current treasurer of the Western State Trail Foundation. "It's a very tough trail," Pickett said. 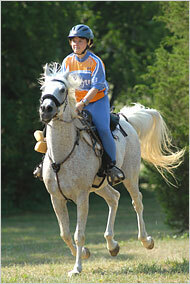 "Even the most prepared riders still run the risk of an unexpected minor injury to their horse." Horses are pulled out by veterinarians any time at any of the 17 checkpoints - for injuries, lack of hydration and metabolic stability, among other factors. Three riders received 1,000-mile buckles Sunday and Cassandra Schuler of Petaluma was awarded a 2,000-mile buckle for completing the race 20 times. "It's a lot of riding," Schuler said. "But I am so grateful to everyone who has ever worked on this ride and those who have crewed for me - which is a lot people. I am hooked on this ride." The Journal's Jenna Nielsen can be reached at jennan@goldcountrymedia.com or comment at www.auburnjournal.com. April Johnson used a G.P.S. device to help create a map used for the Trace Tribute endurance horse ride near Nashville. " Photo: TEAMWORK: Deanna Guinasso of Redding rides her 7-year-old Arabian horse Big Dog near Lake Oroville during the tandem’s first 50-mile endurance ride. Guinasso and Big Dog will compete Saturday in the 100-mile Western States Trail Ride from Squaw Valley to Auburn. Deanna Guinasso's breath is a staccato sing-song: "Hoo, hoo, hoo -- hoo, hoo, hoo -- hoo, hoo, hoo, hoo." And it's all about the exhale. "It's a secret -- I shouldn't tell you -- but it's exhale, exhale, exhale," said the 57-year-old Guinasso, a Redding fitness instructor, former competitive body builder and Ms. National Fitness competitor who happens to own the patent on a little piece of exercise equipment marketed as the Suzanne Somers Toning System. "Don't even think about the inhale, 'cause you have to breath anyway. Think about the exhale and you'll blow away that negative voice that says, 'I can't.' It blows away the toxic buildup." It even helps her horse, a 7-year-old Arabian named RGR Flashfire -- "I call him 'Big Dog,'" Guinasso said -- stay calm. Focused. Ready to run -- hard. The pair will depart at 5:15 a.m. Saturday -- among a braying sea of a possible 250 horses -- to challenge the Western States Trail Ride, a 100-mile endurance ride with nearly 19,000 total feet of elevation in climbs and nearly 22,000 feet of descents. "I know I can do this," said Guinasso, who has run three marathons and twice roller skated 100 miles in competition, from San Francisco to Santa Cruz. "And my horse, he's ready, too. He's going to do the climbs, and I'm going to get off and run the canyons. We're a team; he's my running partner, he's my 100-miler." The Western States Trail Ride -- known in equestrian circles as the Tevis Cup -- is the oldest modern-day endurance ride, having been contested since 1955. The route follows the same course as the Western States 100 Run that was contested on June 23-24. The ride was first organized by Wendell Robie, an Auburn businessman and dedicated equestrian, according to the Western States Trail Ride Foundation Web site. People in the 1950s doubted a horse could cover the trail from Lake Tahoe to Auburn in a single day. Wendell and some friends proved otherwise. He continued to hold the ride annually and also organized the Western States Trail Foundation to preserve the 100-mile trail and the ride. A horse and rider who complete the race in 24 hours -- and is found fit to continue -- wins a silver belt buckle. The rider and horse that complete the course in the fastest time win the Tevis Cup. And to the rider with the fittest horse -- as determined by examination of the first 10 horses to cross the finish line -- goes the Haggin Cup (first awarded in 1964 to Paige Harper, riding his 6-year-old Arabian gelding, Keno). "Arabians are the body builders of the horse world," Guinasso said. "Superior genetics, greatly developed lung capacity. I've got my preference and I wanted a good horse, so I got an Arabian -- coming from the body building world, I want to be buff, too." Despite pushing horse and rider to the limit, Western States Trail Foundation organizers focus not only on the rider's health, but on the health and well-being of the horse. There are several veterinarian checks, as well as mandatory rest stops. If the horse can't continue, your day is done. "You have 24 hours to Git er done,'" Guinasso said. "I'm ready. I'm ready to do well. "And my horse, he's ready, more than ready." For more information on the Tevis Cup, and to keep track of Guinasso and Big Dog's progress in real time, visit www.foothill.net/tevis/index.html. Guinasso's bib number is 83. John Crandell, III 2006 US “Triple Crown” winner – the Old Dominion, the Tevis Cup and the National Championship, John is a dedicated international competitor and trainer who develops high performance strategies for the elite endurance athlete. Stagg Newman Stagg has earned national championships and international gold medals. His horse, Ramegwa Drubin, was the 2003 Hall of Fame inductee; Stagg and his current horse, Jayel Super, have won Old Dominion four times (including 2007); and Stagg recently served as the 2006 president of the AERC. Troy Ball National championship winner in other disciplines, Troy has completed her first year in endurance with two Best Conditions and a gold medal. She offers her fresh outlook and dedication to advancement as a founding member and president of the APEX team. The below Extraordinary rule change proposed by the USEF Endurance Technical Committee was approved. The result is that Endurance will be exempt from needing FEI or National passports for 1* and 2* events. 6. U.S. Competitors competing in their own country in an FEI- sanctioned event, not requiring an FEI Passport, must present a valid USA National Passport or a valid FEI Passport. Exception: Endurance Minor Events. Antelope Butte is the new BH base Camp. Everyone loved it here. No dust, plenty of room and grass AND, LOTS cooler!!!! First loop was a lollipop up to a spot just past Horse Creek and looping back to have the riders doing the first and last 12-13 miles on the same trail. Second loop went up to Jack Creek (19 miles), looped 11 miles) around back to Jack Creek with the last 19 miles the same as the first going backwards. I do not think the ride is much easier, but we did not have the awful heat of the lower camps, and it was great to come back to Antelope Butte for Halfway. Lyle was great as always, along with 2 other vets. No one seemed to have a problem finding trail. Frankly, I LOVE this ride and if it stays up here I think it will still remain a "challenge" without the "worry". All in all, I think the ride was a success and I sure hope it brings more back for nest year and the years to come. Natureza, em 1997, para um jantar dia 18 de Julho (quarta-feira), na Churrascaria GRAN VILLE. O motivo do jantar é reencontar os amigos que participaram do evento e também comemorar seus 10 anos de competição em provas no Brasil. Dominique Freeman representará a Grã Bretanha no Campeonato Pan Americano & Open de Enduro Eqüestre a ser realizado no próximo dia 20 de Julho, na Fazenda Pau D'Alho, em Campinas. Dominique Freeman invites all those who competed at the 1997 PanAm to a 10 year reunion celibration on Wed (18July, at Churrascaria GRAN VILLE. Reconnect with old friends over dinner and also celebrate the 10 year aniverary of Endurance in Brasil! Dominique Freeman will represent Great Britainin the open division of the upcoming 2007 Pan Championship Americano & Open de Enduro Eqüestre to be run on 20July at Fazenda Pau D'Alho, em Campina! The Arabian Horse Association (AHA) will be a contributing sponsor of the 2007 AERC National Endurance Championship, to be held in Oreana, Idaho in August. AHA marketing director Daniel Stevenson said that the organization is interested in broadening their scope to include support of disciplines such as Endurance and Competitive Trail. The Arabian horse breed is by far the best performer in distance events, and some consider this sport to be the ultimate test for the traits that set the Arabian horse apart among other breeds: endurance, heart, strength and soundness. For more information on the event, see the 2007 AERC National Endurance Championship website. For more information on AHA see the Arabian Horse Association website.